Just in case you were too busy watching football on Sunday and forgot “UFC on FOX 9: Road to the Octagon” debuted on Fox Sports 1, no worries because we’ve located the footage to get you up to speed. 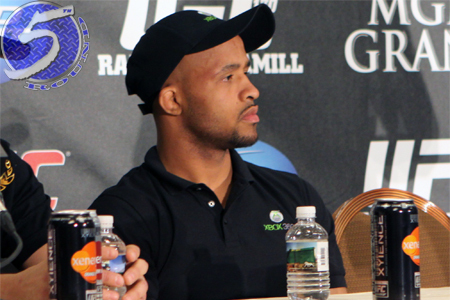 The hour-long documentary followed flyweight champion Demetrious Johnson (pictured) and Joseph Benavidez around as they prepare for their December 14 rematch. “Mighty Mouse” took a split decision victory over Benavidez at UFC 152 to become the Octagon’s inaugural 125-pound champ. Johnson has successfully defended his throne three times since their September 2012 encounter. Urijah Faber and Michael McDonald, who meet in the card’s co-main event, as well as Carlos Condit and Matt Brown also make cameos in the show. Sleep Train Arena in Sacramento, California hosts UFC on FOX 9.